A new survey from Abacus Data conducted for QMI/Sun News finds that if an Alberta provincial election were held at the time of the survey, the incumbent Progressive Conservative Party would win the popular vote by about five percentage points. The survey found that 34% of decided voters would vote for the Tories led by Alison Redford followed closely by the Wildrose Party led by Danielle Smith with 29%. The Official Opposition Liberals are third with 18% while the NDP is at 14%. Five percent of decided voters said they would vote for another party. The Tories are strongest in the two major urban centres getting 34% of the vote in Calgary and 38% in Edmonton. The Wildrose Party is stronger in Calgary (33%) while weakest in Edmonton (20%). The Liberal Party and NDP are strongest in Edmonton. The survey found a gender gap exists between the two leading parties. Female voters were more likely to say they would vote PC (39% PC vs. 23% WRA) while male voters were more likely to prefer the Wildrose Party (34% WRA vs. 29% PC). Respondents were also asked to rate their impression of each of the four main party leaders. While no single party leader stood out from the pack, Wildrose Leader Danielle Smith was the only leader with a net positive favourable rating. 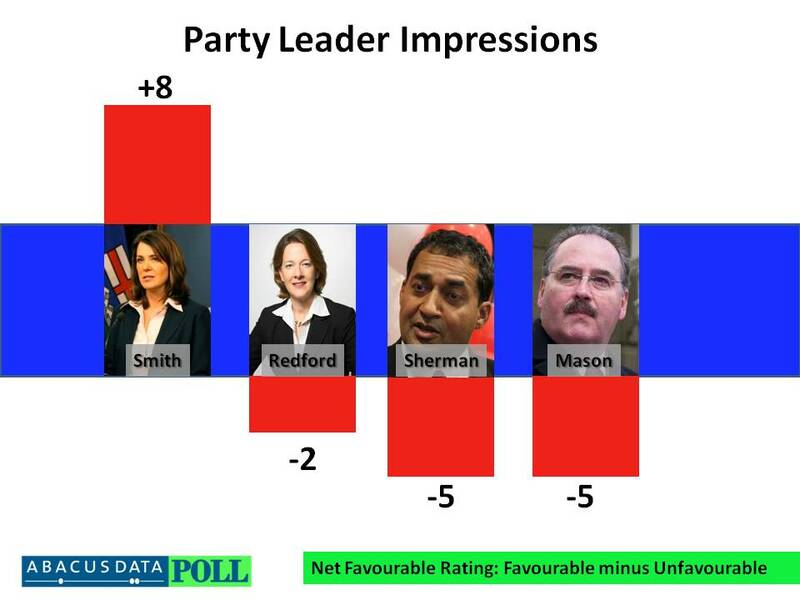 Premier Alison Redford was viewed favourably by 29% of Albertans while 31% had an unfavourable impression of the PC Leader. Three in ten were indifferent towards her while 9% said they were unsure. Danielle Smith fared slightly better than the Premier with a 31% of Albertans having a favourable impression of her and 23% viewing her unfavourably. Both Raj Sherman and Brian Mason were viewed less favourably with more voters having a neutral opinion of both. Both men face a challenge of getting attention in what appears to be a two-party race led by two dynamic female leaders. Overall, a majority of Albertans surveyed (54%) believed that the PC Government in Alberta is headed on the wrong track while 42% believed the PC Government was headed in the right direction. Voters outside of Calgary and Edmonton were more likely to believe the PC Government was headed on the wrong track than those living in Alberta’s largest cities. Over eight in ten PC Party supporters believed the PC government was headed in the right direction compared with 11% of WRA supporters, 30% of Liberal supporters, and 24% of NDP supporters. When asked to rate the current state of the Alberta economy, a majority of Albertans believed the economy was either very good (20%) or good (41%). Another 29% rated the economy as okay while 9% believed it was poor or very poor. PC supporters were more likely to rate the economy as very good while Wildrose Party and Liberal Party supporters were more likely to describe the state of the economy as poor. Respondents were asked which political party they trust most to manage Alberta’s oil sands. One in three Albertans said they trust the PCs the most, followed by the Wildrose Alliance (21%), the Alberta Liberal Party (16%) and the NDP (12%). Sixteen percent said they trust none of the parties to manage the valuable natural resource. “The Alberta election is shaping up to be a fight between urban and rural as well as between men and women,” said Coletto. “Alberta is unique in Canada in that both of the two leading parties have female leaders,” said Coletto. “The gender gap in voter preferences will likely play a critical role in deciding the outcome of the election,” said Coletto. From March 5 to 7, 2012, Abacus Data conducted a provincial survey of 947 Albertans aged 18 and over using Interactive Voice Response (IVR) technology, which allows respondents to enter their preferences by punching the keypad on their phone, rather than telling them to an operator. The survey was commissioned by QMI Agency and Sun News Network. This is the pre-writ survey of Alberta voters. Throughout the campaign, Abacus Data and Sun News/Sun Media will be surveying Albertans on the provincial election. A dual landline/cell phone RDD samping frame was used in this study. The margin of error for a sample size of 947 is + 3.2%, 19 times out of 20. Note that the margin of error is higher for subgroups and caution should be used when making conclusions of data in subgroups with small sample sizes.